With its large menu of flavoursome South Indian dishes and ability to cater to most dietary needs, Sagar is a popular choice. 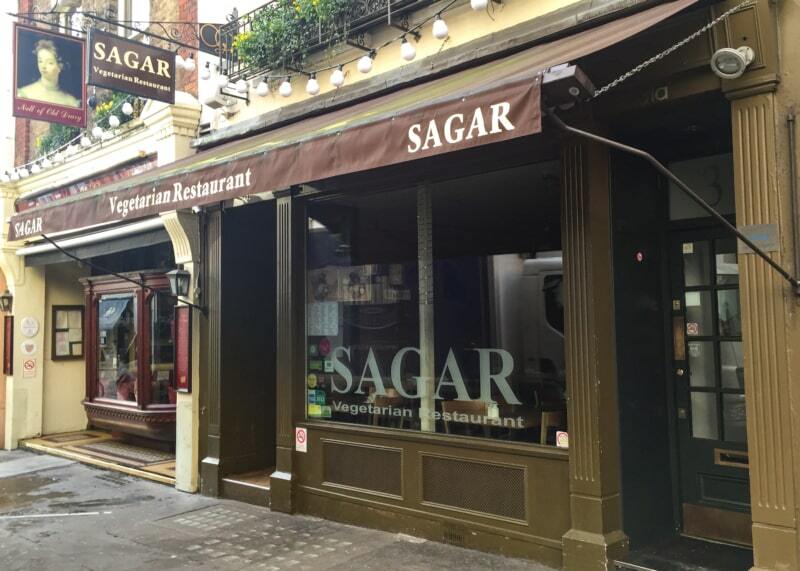 Sagar in Convent Garden is one of a small franchise of Sagar restaurants in London – you can find the others in Hammersmith, Fitzrovia and Harrow. Each restaurant specialises in vegetarian South Indian cooking, or, more specifically, Udupi cuisine, which takes its name from the city in which the famous dosa – a type of pancake stuffed with vegetables – has its origins. Inside, tables for two or four sit beneath dimmed pendant lights, creating a cosy, if simple, interior. Near the back, a spiral staircase leads upstairs to more seating. Enclaves in the wall house small statues and icons, and several gold-coloured textiles hang from the wood-panelled walls. If the surroundings are modest, the menu is a blazing contrast: a wide-ranging list of over 50 individual options. To start, there are South Indian specialities such as: vada, a serving of lentil donuts soaked in warm soup or served on their own; samosas; and rice dumplings with spices, nuts and chutney. Along with other fried snacks and soups, you can find different types of puri, an unleavened bread served with vegetables or chutneys. 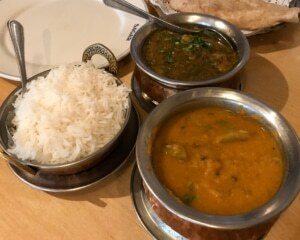 For mains, there’s a terrific choice of vegetable curries (over a dozen including bhindi bhaji, channa masala, saag paneer); thalis (huge platters of starters, sides, curries and desserts), and uttapams, a thick rice and lentil pancake similar to a dosa but topped, like a pizza, with vegetables and spices. 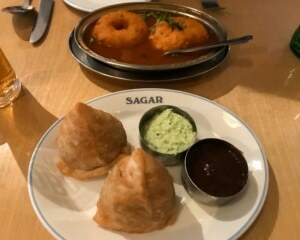 The dosa is perhaps Sagar’s signature offering; it’s stuffed with potato, onions and carrots, flavoured with different spices, and served with coconut chutney and soup. If you don’t mind upstaging those around you, try the impressive paper dosa, a table-sized crispy pancake. Drinks-wise, you have the option of lassis (yoghurt and milk), soft drinks, vegan wine, beer and hot drinks. The dessert menu includes sweet puddings made with rice, raisins and nuts, and a selection of ice creams and sorbets. Dishes on the menu are clearly labeled for allergies, and dedicated menus with lots of options are available for vegans and those wanting dishes free of onion and garlic. The standard menu doesn’t explicitly mention ghee (a dairy product), so ask your server if you’re unsure. Its lively atmosphere, great food, and friendly, attentive staff, make Sagar the perfect spot for a relaxed lunch or dinner in central London, for tourists and Londoners alike.